In an interview with Tom Michael for Walker magazine, Cynthia Hopkins described becoming aware of her own human fragility while on a trip to the Arctic with Cape Farewell, a nonprofit dedicated to raising awareness around climate change to spur cultural shifts leading to sustainable practices. Without markers of scale, distance became difficult to gauge, perspective shifting along with realizations of both the enormity of the landscape and, in comparison, the frail nature of one’s own life. In preparation for this weekend’s performances of This Clement World–and Saturday’s post-performance audience discussion, SpeakEasy, which takes place in the Balcony Bar–here’s a look at key issues at play in Hopkins’ work. Where is she coming from? Part documentary, part folk music-infused theater, part call to action, This Clement World addresses the global issue of climate change through a relatable, human-scaled lens. 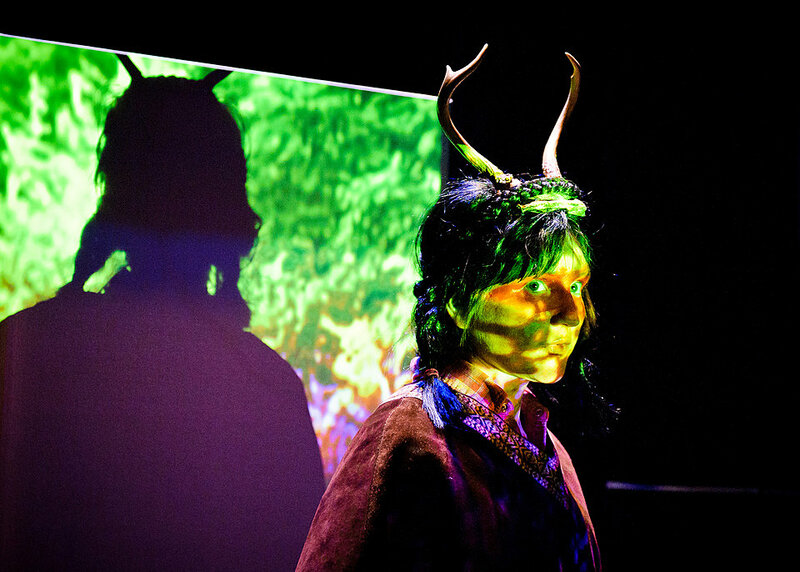 Hopkins frames her multidisciplinary performances as storytelling based in alchemy. Starting from a point of disturbance, she forces confrontations with personal demons and sociopolitical crises, plumbing this darkness to emerge bearing a message of hope, through theatrical productions that educate, stimulate, and entertain. Through shifts from personal to global, Hopkins reveals a portrait of the human being in the world – unique and beautiful, but also responsible to the future, capable of change, and accountable for decisions. Describing influences in an interview for Bomb magazine from Bertolt Brecht to Tadeusz Kantor and Laurie Anderson, Hopkins situates herself in a lineage of theater practitioners who not only comment on social issues, but also self-reflexively draw attention to the act and allure of theatre-making itself. 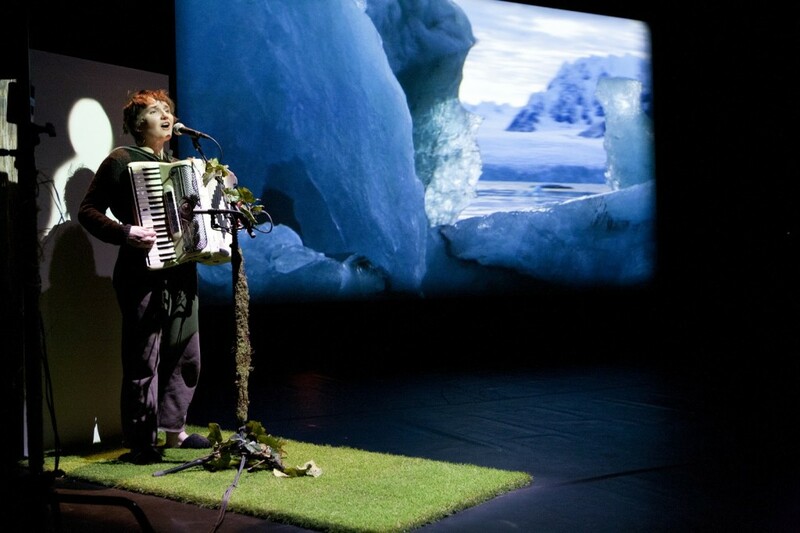 This Clement World entices through music, storytelling, and beautiful footage of the Arctic, but Hopkins also pushes back – directly addressing the audience about climate change and even questioning her own metaphors. Hopkins draws from her own struggles with alcoholism and drug addiction to develop addiction as a metaphor for reliance on fossil fuels – a dependence on that which is causing our own slow, progressive destruction. This comparison brings forth both the challenge of weaning ourselves off fossil fuels and the possibility of self (and social) transformation through actively, diligently developing different practices. Her metaphor also manages to add a physical, bodily component to the climate issue. As a population becomes accustomed to the ease provided by fossil fuels, the more that is consumed, the more normalized the behavior becomes, the more we want, the more we need. Addressing climate change in this regard means assessing our own personal addictions and culpability. It means changing daily habits, overhauling systems, and perhaps altering other fundamental patterns – a consumer economy based on disposable commodities and the disproportionate over-use of resources by a relatively small proportion of the global population. Underlying Hopkins’ metaphor is the luxury of inaction. Focusing on various other immediate crises, climate change may appear as a distant issue, a problem that we can get to later on. In A Conversation on Climate Change, the Walker brought together specialists to focus on the science surrounding this issue and the ramifications that are already being observed – changing weather patterns, melting Artic ice, the increase in instances of extreme weather. As Hopkins notes, this is a pressing issue and a significant time to be alive, for what is or is not done now will have considerable consequences for future generations. In This Clement World Hopkins both relates her own experiences and becomes a variety of characters – an alien, a visitor from the future, and the ghost of a Native American woman murdered during the Sand Creek massacre in 1864. Each character provides a distinct perspective, a means of interfacing with the audience and another tactic for getting the point across that something needs to be done. In particular, although the ghost does not speak, her emergence brings forth one thread of a long history of environmental destruction intertwined with violence, where those with the least power endure the most. Turning from the grand suffering of the plant and future generations to the immediacy of violence, climate change might be viewed as the crest of a building wave poised to engulf individuals and whole communities. As this issue is addressed – or not – how will victims be represented, how might their stories be told, and by whom? In a conversation with Walker web editor Paul Schmelzer and meteorologist Paul Douglas, Hopkins highlights other aspects elaborated by this character – the interdependence of humans and the natural world, as well as the impermanence of a way of life, the inevitable change, by necessity or choice, of unsustainable practices. According to a UN report, the world population is set to increase from 7 billion to 9 billion by 2050. This anticipated change means that if only small actions are taken, such work could easily be off-set by population growth alone. The concern goes beyond necessities such as water, energy, food, or land, to include the perpetuation of consumption habits. Isolating just one piece of this issue is telling – the United States currently houses less than 5% of the global population, but uses roughly a quarter of the world’s fossil fuel resources. At A Conversation on Climate Change, the immediacy of the issue and the need to do something now was brought to the fore, leading to the question of how to tackle such a massive personal – personal action, or perhaps a movement? More realistically, it was proposed that the incentive to change will likely come not from rhetoric of doing right by future generations, but rather profits to be made from solutions to impending, global crises. Tackling climate change will likely lead to an array of debates around initiating and managing large-scale practices, yet the urgency to do something remains potent, for in this instance, both action and inaction have consequences. Join us after the show on Saturday, March 9, in the McGuire Theater’s Balcony Bar for a SpeakEasy — an informal post-performance audience discussion. This week’s conversation will be facilitated by Walker Art Center tour guide Barbara Davey and choreographer Jennifer Arave. Please share thoughts, comments, and questions below!